The Cloverleaf paddle features four concave parabolic areas that allow the Blind Juggler to indefinitely bounce up to four balls at the same time. With the Cloverleaf Blind Juggler, we can demonstrate the rich dynamics that a bouncing ball on a paddle exhibits. For example chaotic ball motions or the simultaneous existence of distinct, stable periodic ball motions. 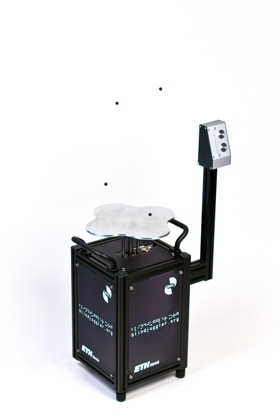 Currently, we use the Cloverleaf Blind Juggler for research in algorithms for efficient control of systems with underlying symmetries (the identical balls). You can read more about this research project here.